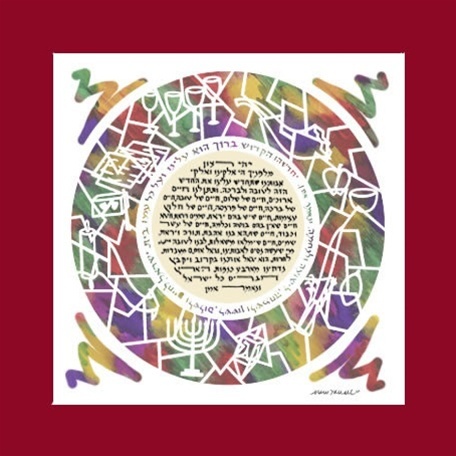 Size: 45.7 x 45.7 cm / 18 x 18"
This circular stained-glass-like design offers a symbolic representation of all the holidays that occur during the cycle of the Jewish year. 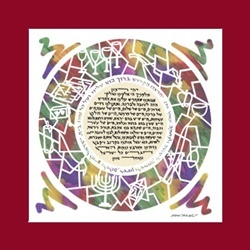 The text of Birkat HaChodesh is recited during the Shabbat morning services, one time each month, with the coming of the New moon. In this prayer, we ask for the coming month to bring only goodness and blessing. Text Translation of Birkat HaChodesh: May it be Your will, Hashem, our G-d and the G-d of our forefathers, that You inaugurate this month upon us for goodness and for blessing. May You give us long life – a life of peace, a life of goodness, a life of blessing, a life of sustenance, a life of physical health, a life in which there is fear of heaven and fear of sin, a life in which there is no shame nor humiliation, a life of wealth and honor, a life in which we will have love of Torah and fear of heaven, a life in which our heartfelt requests will be fulfilled for the good. "men, Selah. Around the text: May the Holy One, Blessed is He, renew it upon us and upon all His people, the Family of Israel, for life and for peace, for joy and for gladness, for salvation and for consolation. Now let us say: Amen.